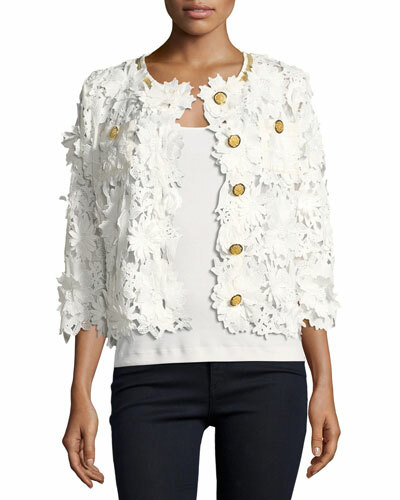 Neiman Marcus makes clothing a stylish affair with its collection of women’s plus size jackets and coats. We offer you a wide selection of plus size trench jackets, long vests, and more in attractive designs and cuts. 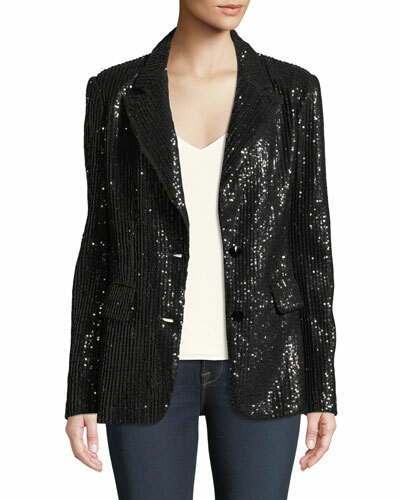 Our women’s plus size blazers are tailored to make you look gorgeous. You can also opt for plus size cropped jackets for an edgy look. Choose from our collection of plus size printed metallic jackets and topper coats to look hip and modern. We offer all the latest trends from the biggest fashion houses in eye-catching styles. 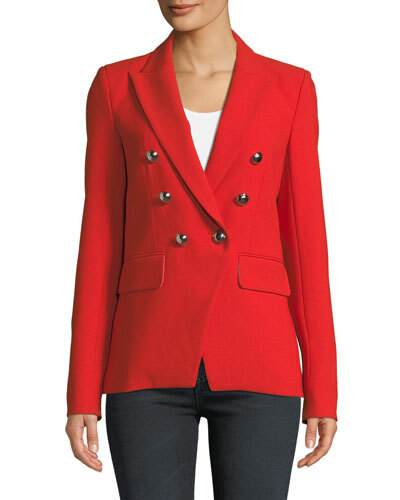 Shop Neiman Marcus for a wide assortment of women’s plus size jackets and coats. Blanc Noir "Castro" ponte-knit blazer with leather inserts & back lace-up details. Notched lapels; single-button front. Long sleeves. Front flap pockets. Tailored silhouette. Viscose/nylon/spandex. Nylon/spandex lining; fill, polyester. Imported. Model's measurements: Height 5'10"/177cm, bust 33"/84cm, waist 25.6"/65.2cm, hips 35.8"/91cm, dress size US 2-4/FR 34-36. 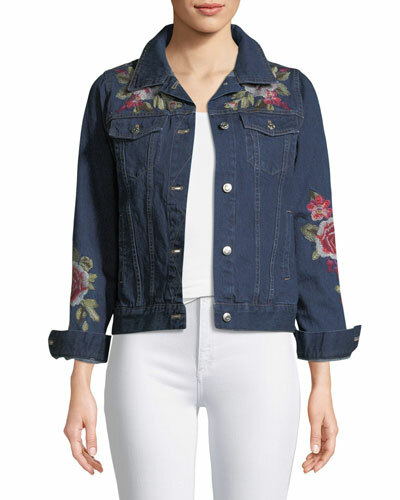 EXCLUSIVELY AT NEIMAN MARCUS Escada jacket in floral-print jersey. Notched lapels; one-button front. Long sleeves; button cuffs. Front flap pockets. 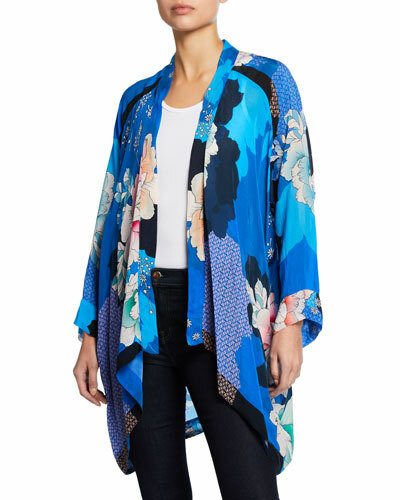 EXCLUSIVELY AT NEIMAN MARCUS Escada jacket in floral-print jersey. Notched lapels; one-button front. Long sleeves; button cuffs. Front flap pockets. Tailored fit. Straight hem. Viscose/spandex. Imported of Italian materials. Model's measurements: Height 5'10"/177cm, bust 33"/84cm, waist 25.6"/65.2cm, hips 35.8"/91cm, dress size US 2-4/FR 34-36. 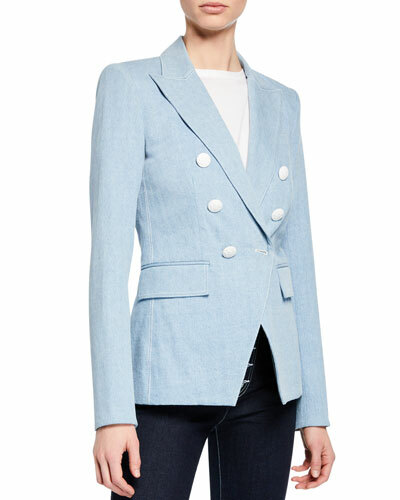 Oscar de la Renta blazer in wool gabardine. Peak lapels; one-button front. Long sleeves; button cuffs. Front welt pockets. Tailored silhouette. Virgin wool/spandex. Lining, silk. Made in Italy. Model's measurements: Height 5'10"/177cm, bust 31"/79cm, waist 24"/61cm, hips 34"/86cm, dress size US 0/2. Theory "Power Jacket 2" in Modern corduroy. Notched lapels; one-button front. Long sleeves; button cuffs. Side welt pockets. Tailored fit. Theory "Power Jacket 2" in Modern corduroy. Notched lapels; one-button front. Long sleeves; button cuffs. Side welt pockets. Tailored fit. Center back vent. Cotton/spandex. Imported of Italian materials. Model's measurements: Height 5'10"/177cm, bust 33"/84cm, waist 25.6"/65.2cm, hips 35.8"/91cm, dress size US 2-4/FR 34-36.